23 mm x 16 mm. Shiny Black Tapered Strap. Buckle End measures 2 7/8 inches and the Hole End measures 4 1/2 inches. Yellow Buckle included. 17 mm x 14 mm. Shiny Honey Strap. Buckle End measures 2 1/2 inches and the Hole End measures 4 inches. Yellow Buckle included. 21 mm (with 12 mm cut out) at the lugs x 20 mm buckle. Buckle End measures 3 inches and the Hole End measures 4 1/2 inches. Buckle NOT included. 24 mm at the lugs x 22 mm buckle. Buckle End measures 3 inches and the Hole End measures 4 1/2 inches. Buckle NOT included. 24 mm at the lugs x 18 mm buckle. Tapered band. Buckle End measures 2 7/8 inches and the Hole End measures 4 1/2 inches. Buckle NOT included. 18 mm (with 4 mm cut out) at the lugs x 14 mm buckle. Buckle End measures 2 3/4 inches and the Hole End measures 4 1/2 inches. Buckle NOT included. 12 mm x 12 mm. 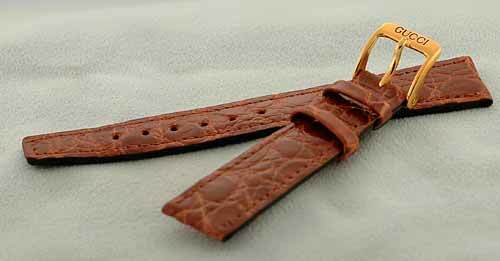 Very Dark Brown Strap. Buckle End measures 2 3/4 inches and the Hole End measures 4 5/16 inches. Yellow Buckle included. 23 mm wide. Measures 7 inches around. 9 mm wide. Measures 6 1/2 inches around. 4 mm screw lock connector. Measures 6 1/2 inches around. 14 mm tapers to 15 mm curved end links. Measures 6 1/2 inches long. 18 mm tapers to 19 mm curved end links. Measures 6 3/4 inches long. 22 mm. Measures 7 inches long. 15 mm. Measures 6 3/4 inches long. 23 mm. Measures 6 1/16 inches long. 21 mm. Measures 7 inches long. 22 mm. Measures 6 7/8 inches long. 19 mm lugs with end links taper out to 28 mm. Measures 7 inches long.